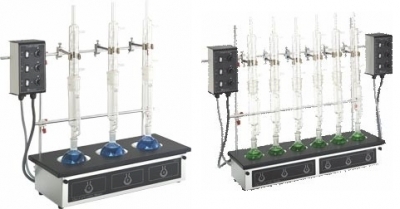 Glas-Col's combination mantles have always been the mantles of choice for repetitive extracting, refluxing, and distilling procedures in labs of the food, textile fiber, water and waste-water, petroleum, and many other industries. Glas-Col's latest version offers safety and convenience never before available in a multi-place heating mantle. •Clear anodized aluminum cabinet with black PTFE resin coated top for chemical resistance. 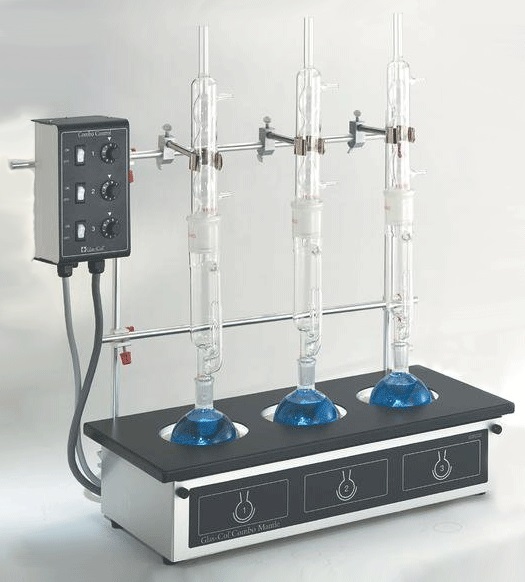 •The ideal mantle for Kjeldahl, Soxhlet, and other extraction procedures. 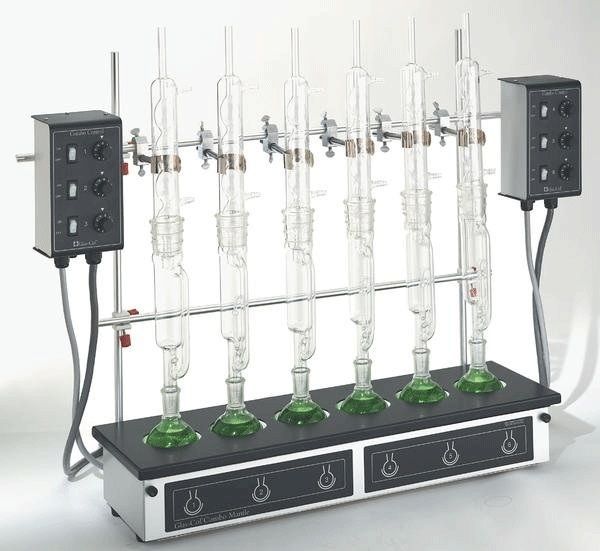 Each six-place Combo is furnished with six spring-type glassware clamps, and each three-place unit contains three. The clamps hold glassware from 1 5/8" - 2" in diameter. The clamps attach to one of the horizontal support rod (included). Two Series RL control choices are available percentage timer or proportional voltage. The percentage-timer version pulses full-line voltage to each heating position according to the dial setting. The proportional-voltage version supplies a constant, steady-state voltage to each position. 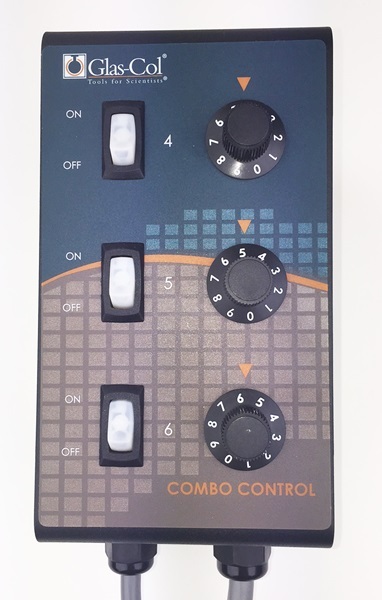 The six-place controls are actually two units that can be mounted together or separately. The cord-connected controls allow placement at a convenient location for the operator. Electrical: Three-place control has 1-6ft., multi-conductor interconnect cord to mantle and 1-4ft., long, 3-wire power cord with grounding plug. 6-place control has 2-interconnect cords and two power cords. 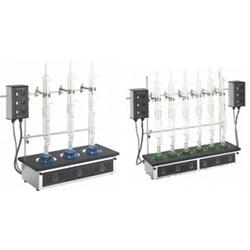 Digital indicating Temperature control packages are available for both the 3 & 6 position combo mantles and includes High Temperature Limit cut off. Power Controls - 104A RL series. ·6 place w/two quick attach open face bracket for 1/2" diameter rod. One 6ft long interconnect cord to the mantle and one 4ft long 3-wire power cord with grounding plug. One 6ft long interconnect cord to the mantle and one 4ft long three wire power cord with grounding plug. Two 6ft long interconnect cords to the mantle and two 4ft long three wire power cords with grounding plug. Two 6 ft. long interconnect cords to the mantle and two 4ft long three wire power cords with grounding plug. One 6ft long interconnect cord to the mantle and one 4ft three wire power cord with grounding plug. One 6ft long interconnect cord to mantle and one 4ft long three wire power cord with grounding plug. Two 6ft long interconnect cords to mantle and two 4ft long three wire power cords with grounding plug. 6 spring type glassware clamps for glassware 1 5/8 - 2" diameter. These attach to horizontal support rods. Six spring type glassware clamps for glassware 1 5/8" - 2" diameter. These attach to horizontal support rods. 6 spring type glassware clamps for glassware 1 5/8 to 2" diameter. These attach to horizontal support rods.